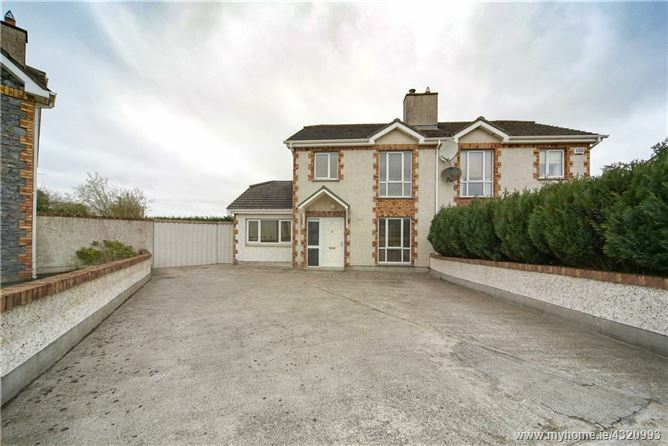 Sherry FitzGerald Tom Fox is pleased to bring to the market this 4 bedroom semi detached situated in the heart of Rathwire village. This well looked after and much loved house comes on the market in excellent condition. On entering the property there is a tiled hallway and guest wc. The sitting room has laminate flooring, wood surround fireplace and solid fuel stove with back boiler. The dining room has laminate flooring and patio doors. The kitchen has fitted units, tiled splash back and floor, fridge-freezer, cooker & hob included. There is also a back hall way with tiled floor. A utility room is located off the kitchen with fitted units and is plumbed for washing machine and dishwasher. To the front of the house there is a downstairs bedroom with laminate flooring. On the first floor are three bedrooms all with laminate flooring and two with fitted wardrobes. The master bedroom has en-suite that is fully tiled with wc, whb and electric shower. The family bathroom is fully tiled with wc, whb and bath with shower head. To the front of the property there is a double driveway and a side entrance with drive through acess that leads to a very large back garden with low maintenance and a steel garden shed. Living Room 4.346m x 3.304m. Laminate floor, wood surround fireplace and solid fuel stove with back boiler. Kitchen 3.430m x 2.801m. Fitted units, tiled splash back & floor. Fridgefreezer, cooker & hob incl. Utility Room 2.568m x 1.938m. Tiled floor, fitted units & plumbed for washing machine and dishwasher.